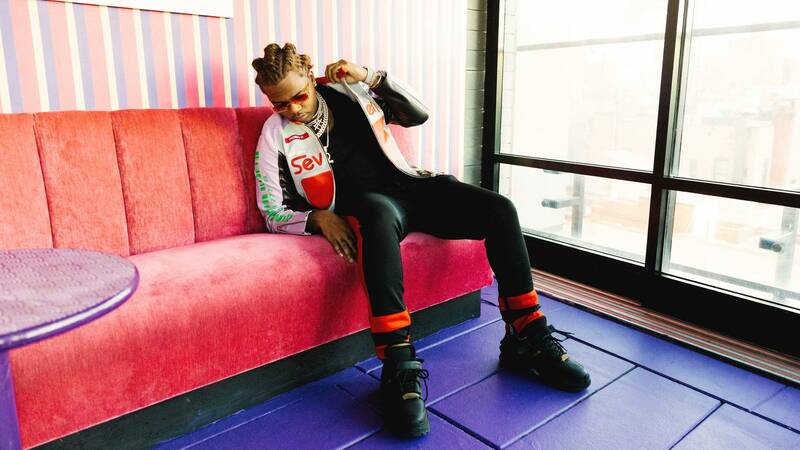 Gunna is preparing to put out Drip or Drown 2, technically his debut album, later this month on Young Thug’s YSL Records, but he already boasts a sartorial trademark and has made a strong case for fashion month MVP. Shortly after we spoke on Friday, he sat front row at the Palm Angels show, where he hung behind a billowing cloud of blunt smoke with French Montana, and, just before 1 am, performed at the brand’s afterparty. The next night, he did a repeat performance at John Elliott: shades, front row blunt, keep the party going until late into the night. Part of being a young rapper—Gunna is 25—is not merely dressing the part but knowing your Raf Ozweegos from your Margiela Fusions. It also means sitting front row at fashion week. Gunna prefers to take in a show under the influence of weed, he explains, “’Cause when you high you think a lot. So when you lookin’ at all these pieces, you’re like, Oh, I know what I’m gonna do when I get that.” This is the man who claims to have invented drip, after all: “It’s like style, persona and like, how you carry yourself. That’s your drip.” You can see how that plays out in Gunna’s style, which is less about the individual pieces than how he mixes them, like the lime green windbreaker and cargo pants he paired with a tie-dye cable knit turtleneck. When we met, he was wearing sweatpants with a red tuxedo stripe (he doesn’t remember who made them) with black Margiela sneakers and a jacket made from leather patches in pediatrician’s office purple, yellow, red, and placid green. On the back was the image of a giant pill and the text, “THINK OF ME AS A FRIEND.” Gunna said a guy got it for him in Japan; he had no idea who made it, but said it was “rare.” His hair was in frosty cornrows. He was wearing two tennis chains, two different kinds of crosses, and a Cuban link chain. He laid down for our interview (supine mode!) and remained stoic behind those rectangular shades. And like all people who are famous because they want to be, he smelled amazing. One of the perks of life at YSL Records is that Gunna has Thugga as a shopping partner. “We just went shopping together in Atlanta for Super Bowl weekend. We went shopping at Jeffrey’s and fucked Jeffrey’s up,” he said, referring to the Meatpacking District luxury store that also has a branch in Atlanta. He bought some Amiri shirts, he says, plus “two see-through Dior shirts. I got a Dior belt, I bought a Dior bag, like a little satchel. I bought a button-down, white with blue flowers—Dior shirt. Nice. Then I walked outta there and went to Gucci, got some Gucci pants—they got some new pants that just came out, they like cheetah and zebra print. They crazy.” Sounds like he is drowning in drip. Thugga is just “crazy,” Gunna said, going into a pitch-perfect imitation of his friend and mentor in full-on shopaholic beast mode: “‘Gimme deez.’ ‘Oh deez hard—you seen deez? !’ ‘You got deez?’ All you gonna hear all day. ‘You got deez?! You got deez in my size? !’ All day.” Shopping has always been a part of hip hop, but the new generation of rappers shops with unparalleled zeal, dropping tens of thousands of dollars at luxury monoliths and cult boutiques alike. It’s a wonder brands can keep up with their sprees. In part, this may be because Atlanta is commercially blessed with gems like Jeffrey’s and the legendary Lenox Square mall. But it also seems, with Gunna as a case in point, like the crazier you’re willing to get with your clothes, the better it’ll be for your career. Then it was time for him to move on. The Palm Angels show wasn’t for a few hours, but maybe he had some shopping to do.